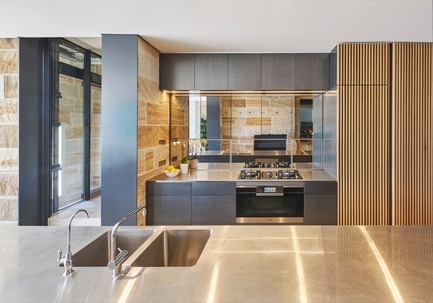 Design ingenuity and a dose of respect for its original Gothic Revival bones deliver a blighted 1870s harbourside home in Sydney into the 21st century. 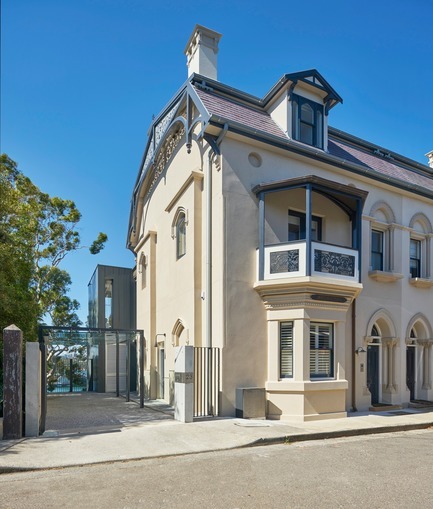 CROSSING THE GOTHIC REVIVAL threshold of Maybanke, the waterfront home on Sydney Harbour with a distinguished history, is to traverse 150 years in a few short steps. 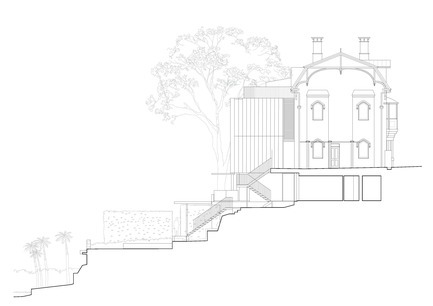 Panoramic water views, an abundance of penetrating antipodean light and a five-storey sculptural stair – that together would surely have befuddled and amazed the 1870s sensibilities of the individuals who built the original building – leave the modern visitor in no doubt which century this home now squarely belongs. Not that AJ+C had much of the original fabric to celebrate – and then massage – into contemporary times. For years the building had languished unloved in architectural limbo, as a block of nondescript flats. 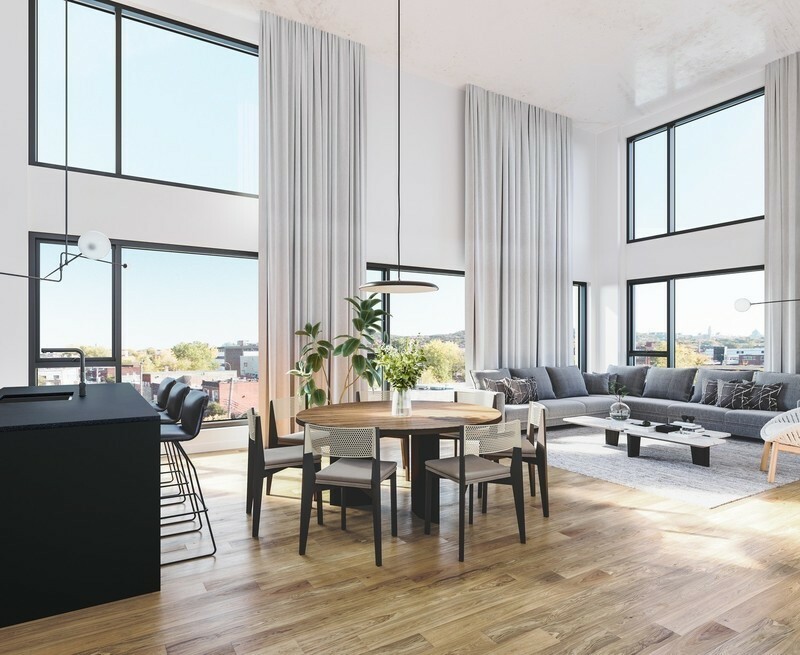 “It was an incredibly ugly building,” says AJ+C’s Jim Koopman, Design Director for Maybanke’s fresh and entirely more elegant 21st Century re-awakening. 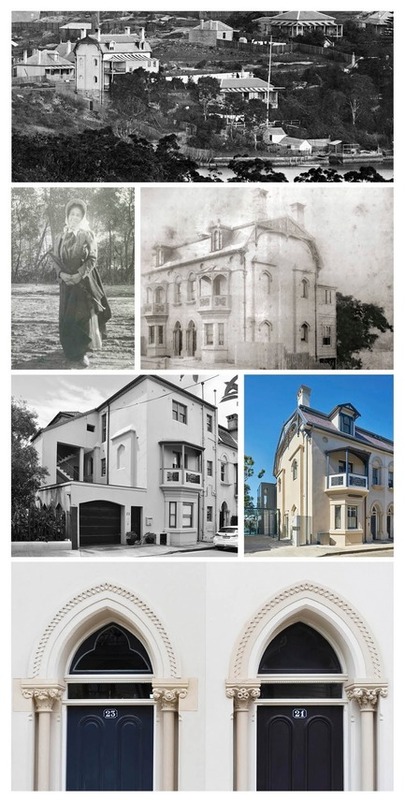 There was little evidence beneath its unsympathetic 1930s bunker-like façades of its Gothic Revival sensibilities – nor indeed of its historical significance as the home of the educationalist and champion of women’s rights in Australia’s Victorian Era, Maybanke Anderson. Anderson was the sister of noted local engineer of that time, Norman Selfe, who owned Normanton, the house next door. Selfe designed and built the adjoining houses in 1876-1877 and, in 1938, Maybanke was unceremoniously converted into a plain old block of flats with zero concern for any aesthetic or historical relationship to its adjoining neighbour. Maybanke was turned from bourgeois townhouse into workers’ multi-housing – cramped but functional in a fraction of the time and with a fraction of the effort and care it had taken to create it less than 70 years earlier. “It looked like some sort of tumour on Normanton,” says Koopman of Maybanke Flats, as it became known after 1938, adding that Normanton’s surviving French Renaissance-inspired Mansard roof and Gothic Revival detailing – its stone hood-mounts, ornamental trims, its tall chimneys – were evidence of what Maybanke might have looked before being entombed beneath expressionless masonry, concrete and render. That said before any real work on pairing back, improving and adding to the Victorian structure could begin a final battle against the soddenness of the Sydney sandstone outcrop upon which it sits, had to be waged and won – at considerable cost and over a period of nearly eight months. The job would mean all the building’s 1870s foundations had to be removed, the house suspended and slabs inserted under the existing walls. Permanent access also had to be provided behind the existing stone walls for future maintenance and to guard against damp breaching the porous sandstone walls. Today the front and side façades have been restored to echo Normanton next door – with its bay windows, balconies, chimneys, copper downpipes and dormer window in a Mansard roof and Gothic Revival ornamental stone trims, mounts and detailing. Look more closely and you can see that on Maybanke’s new skin the attention to detail has been even more extraordinary than its neighbour’s original details. 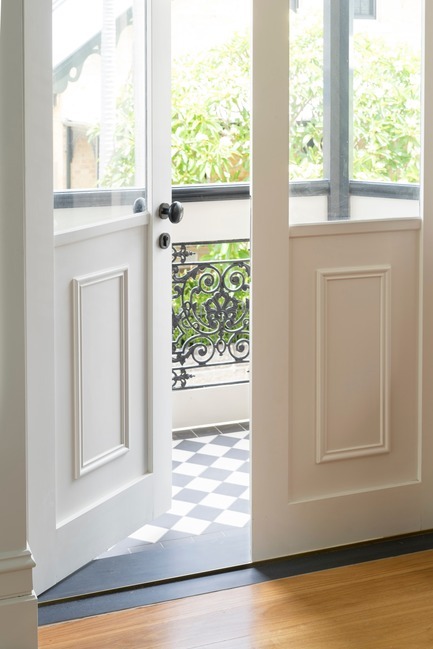 For Maybanke circa-2017 an expert local stonemason was employed, sculpting the exquisite details above the doors and windows to sketches by AJ+C project architect Caroline Kite’s design. But it’s only once inside the front door that the visitor can appreciate quite how ambitious the vision for the total structure – old and new wings – has been. 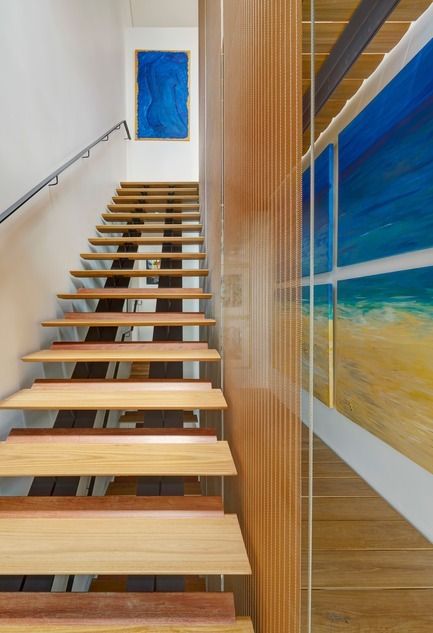 Dropping down beside the length of the stair is a tensioned steel screen as balustrading, fabricated in and imported from Germany (“three rolls of heavy metal”, says Jim). 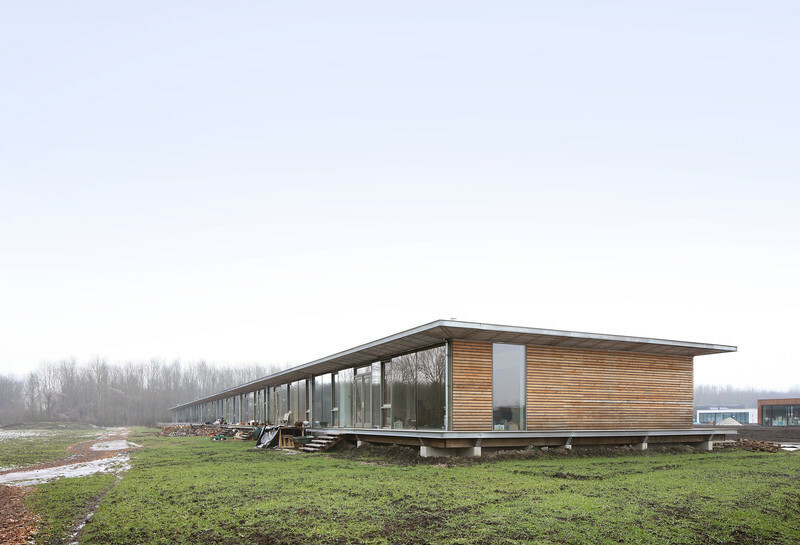 The five-floor scheme, Koopman explains, hinges around the idea that during the working week it’s the middle two floors that are lived in. 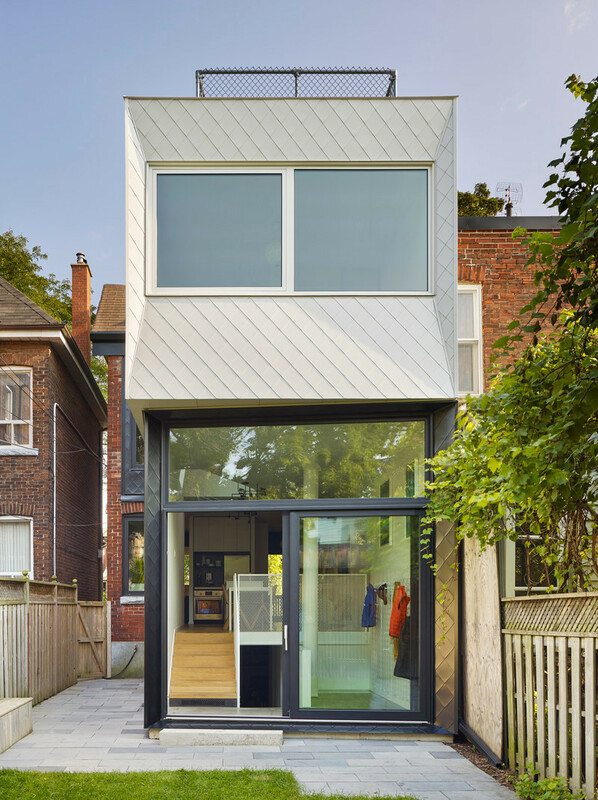 “It equates to a one bedroom apartment over two levels with direct access from the street,” he says. 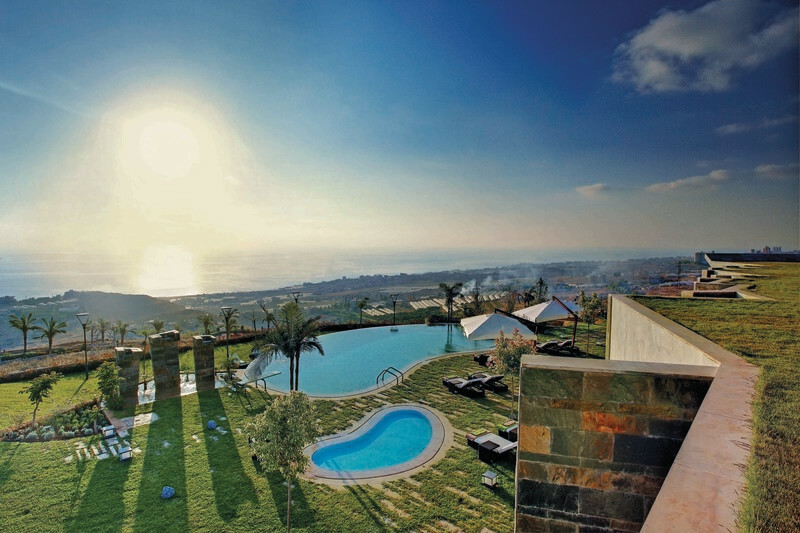 The rest of the time the home is designed as a place to entertain friends and accommodate the owners’ visiting families. 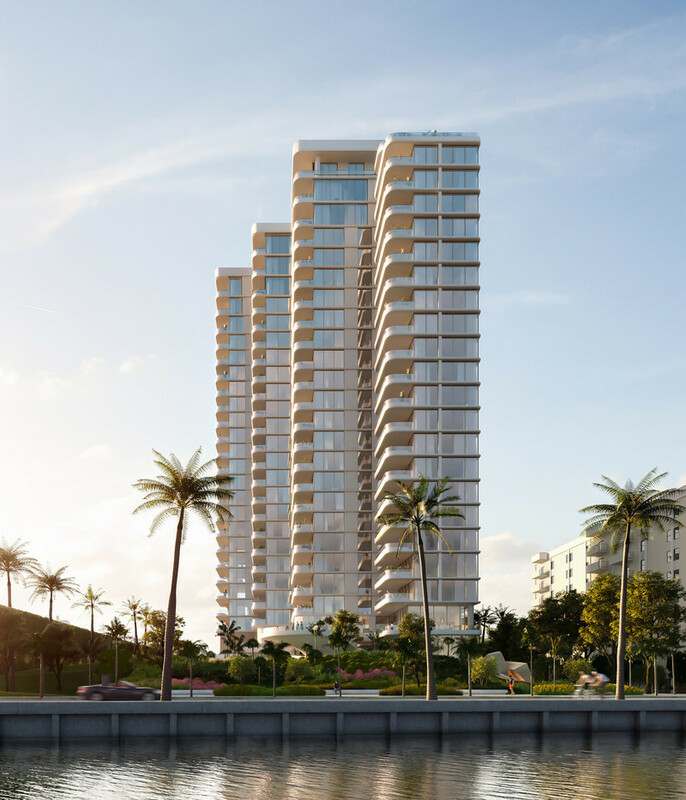 One enters Maybanke at the level of the master bedroom suite with its impressive walk-in wardrobe and ensuite bathroom overlooking the harbour. 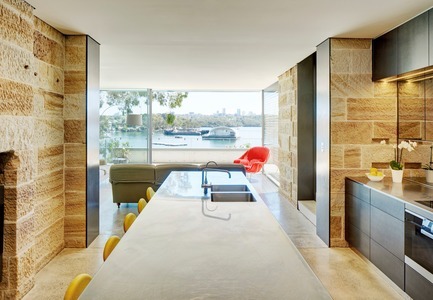 At the level below the street, via lift or exposed concrete staircase – is the main living space, facing north east over its little inner western corner of Sydney Harbour known as Snails Bay. 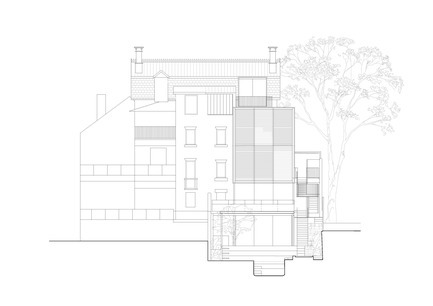 On the level above the street are the guest bedrooms and living spaces. 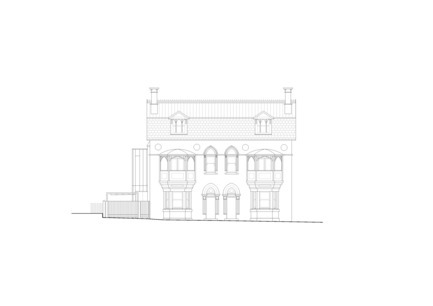 Beneath the Mansard roof on the top level is self contained space that can operate variably as a home office, guest accommodation or a New Years Eve entertaining space. 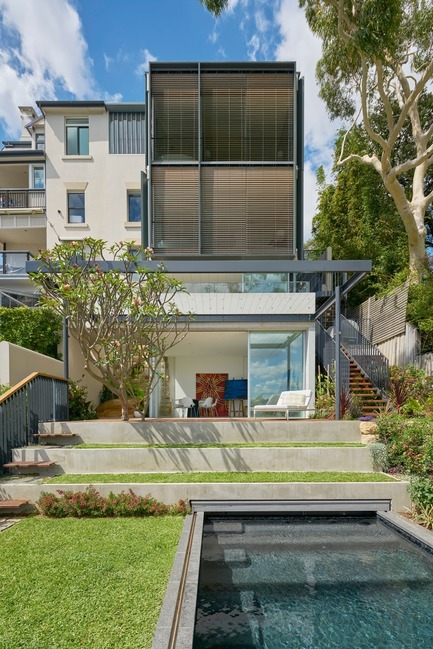 The space also boasts a small roof deck facing the harbour. And finally an artists studio has been excavated from the sandstone opening out onto the garden terraces and lilypond. Today, with light pouring in from the windows facing the harbour beyond, it’s hard to picture the wet dungeon the space must have been. On this level, today there’s also a wine cellar (and an impressive collection of single malt scotch), leading off from the kitchen, a laundry and store. The dining area opens to another deck overlooking the garden, complete with plunge pool, which steps down to the harbour’s edge, far below. 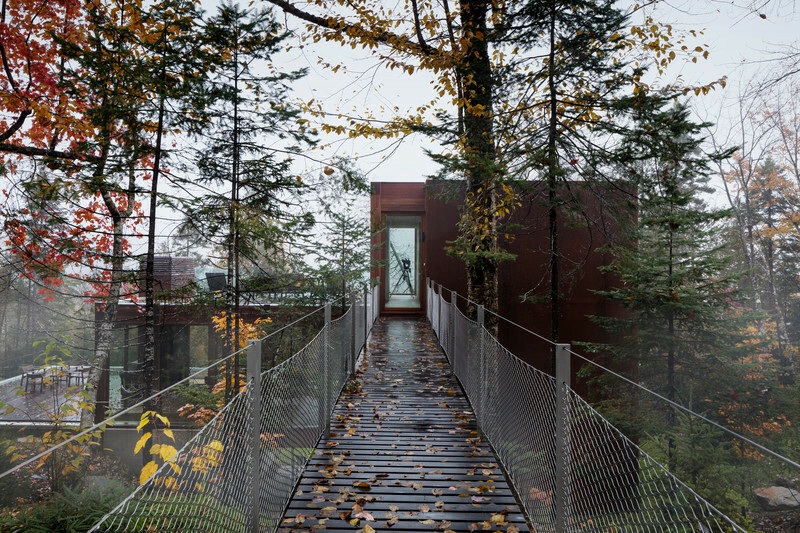 AJ+C is an award-winning, boutique architectural practice offering crafted designs for a diverse range of clients. 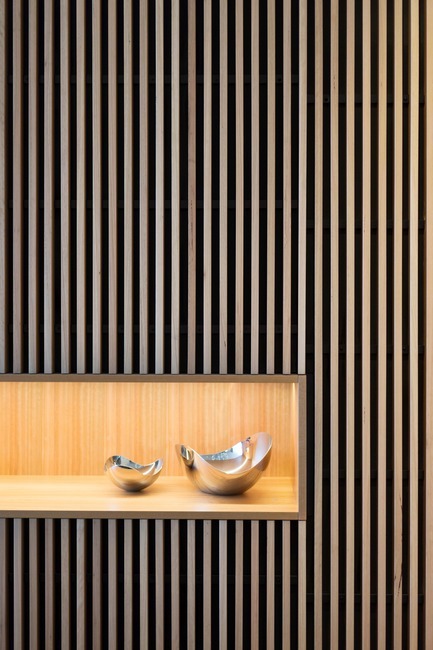 Their people and culture, collaborative client relationships, and design approach all contribute to the successful delivery of innovative and sensitive designs that enrich people’s lives, and sympathetically respond to the community and environment in which they sit. She was an incredibly powerful woman of her time. View of Maybanke from Wharf Road with original front and side facades restored from it's unsympathetic 1930's conversion. 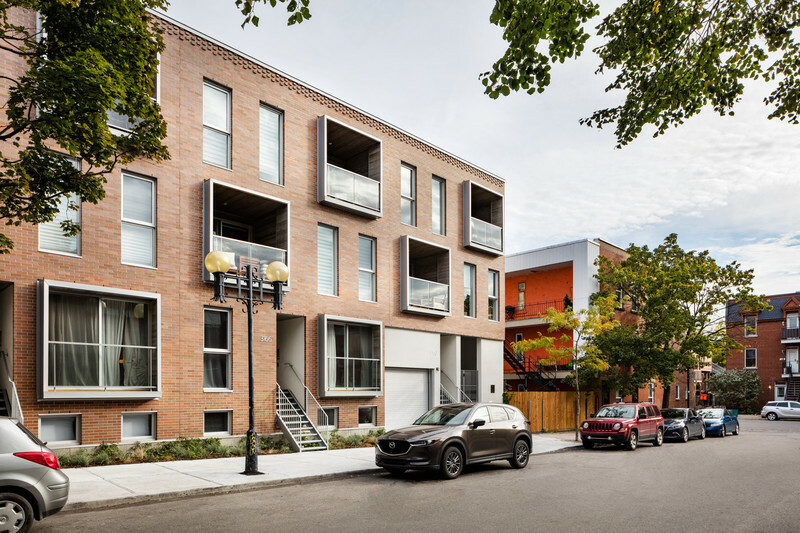 The bay windows, balconies, chimneys, copper downpipes and dormer window in a mansard roof, and gothic revival stone trims, mounts and detailing were reinstated. 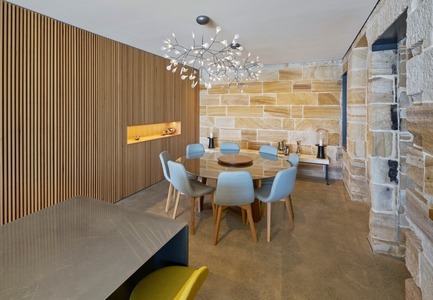 The original stone foundation wall is a feature of the dining room and kitchen. The exposed sandstone has around eight ex-convict signature 'sparrow picking' styles inscribed from when the original structure was built in the 1870's. There was a few stonemason's around Sydney at that time so it was common to use this technique as a way of signing each block. The originial Mansard roof was reconstructed and now forms a series of folded planes in the ceiling of the studio space. "When you walked in the front door, you entered a space that felt like a rabbit warren with a narrow contorted stairwell - there was no sense of arrival that grand stairs of those old houses often had. 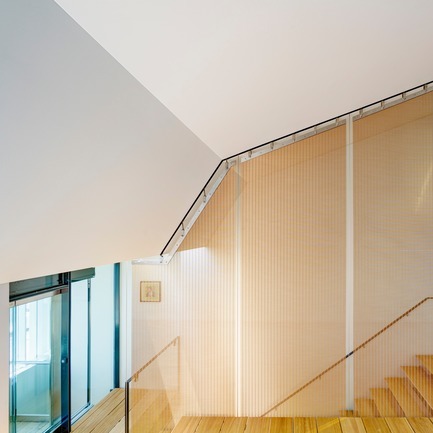 As we had to connect five storeys… the stair became the most important interior gesture of the house. 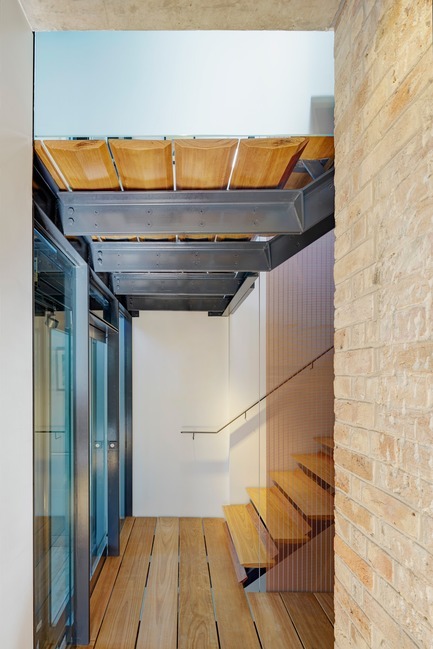 It was designed to transform the stairwell into a vertical volume, day lit by a skylight and a glazed lift shaft that also provides wonderful glimpses of Sydney Harbour as you move through the stair." 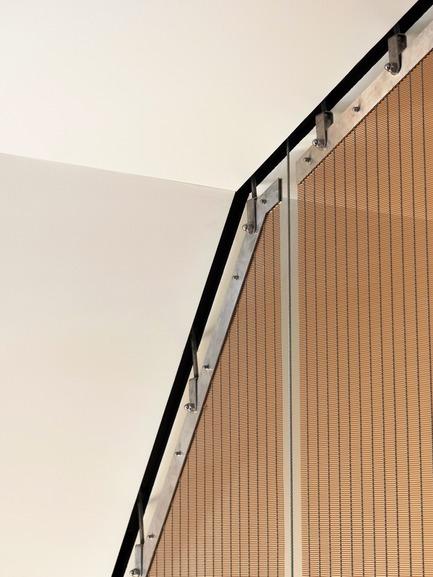 Detail of the tensioned steel screen that drops down besides the length of the stairs as balustrading across three levels. 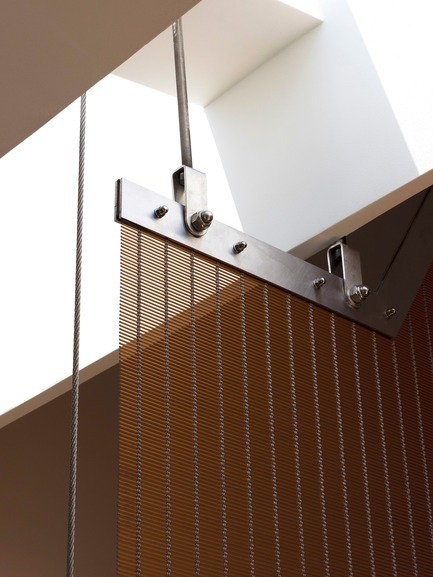 The tensioned steel screen, while visually it is incredibly light, it is extremely heavy and is supported by a substantial structural frame. 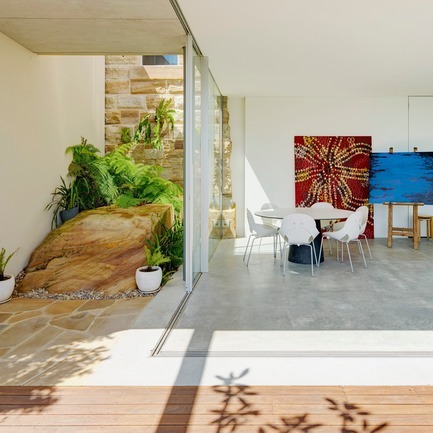 The artists studio opens out to the deck and garden, with views of Snails Bay in Sydney Harbour. Naomi Simon, owner of Maybanke, is an Australian Entrepreneur, Author, Speaker, LinkedIn influencer and Shark on Shark Tank TV show. 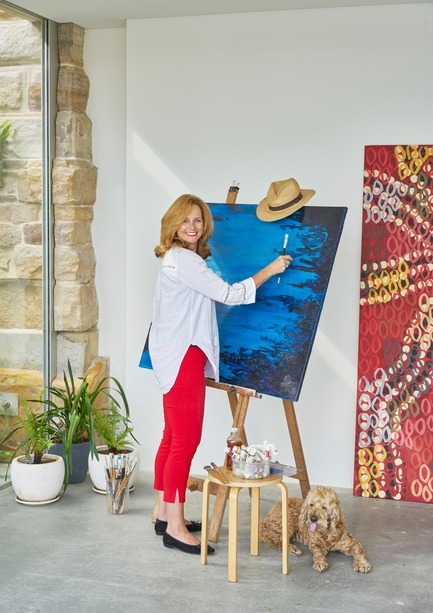 She enjoys painting in her Artist Studio.